Notaries are sometimes asked to notarize a signature on a document that has no date on it. If there is no date, you can still notarize the signature as you normally would, provided that all other requirements for notarization in your state are met. You can write down a note in the “additional information” section of your journal entry that the document did not have a date. The date of the notarization is separate from the document date, and should be recorded in the appropriate section of the journal entry. Remember that under no circumstances are you permitted to backdate or otherwise falsify the date a signature is notarized, regardless of whether the document has a separate date on it or not. Many documents are not dated. Makes no difference. I always put a date on my notarization, so the notarization is dated. In CA, I believe if the document doesn't say then you write the day you notarize it right? Hello Tara, You would need to enter the date the notarial act took place on the certificate wording and in your journal entry (GC Section 8206). You may make a note in your journal entry that the document itself was not dated. It's OK to Notarize a non-dated document because you're Notarizing the signature, not the doc. I have a document that is not dated except for the year. The notary signed the document and her commission expired before it was filed. I have contacted the notary and she has lost her journal of 20+ years. Can she sign an affidavit that her journal is lost? Thus, in my opinion the document is invalid. Is this the proper course of action? Hello. Normally, a notarization is valid if the Notary completed it properly while the Notary's commission is still current. If you have concerns that the situation may affect the validity or legal status of your document in some way, an attorney would be the best person to answer any questions regarding whether the document is still valid and what steps if any need to be taken. Hello. We're sorry, but we were not clear from your comment if you are asking about notarzing a document with no date or about keeping a journal in Texas. Can you please clarify what information you are looking for? Thanks and we are sorry for any inconvenience. 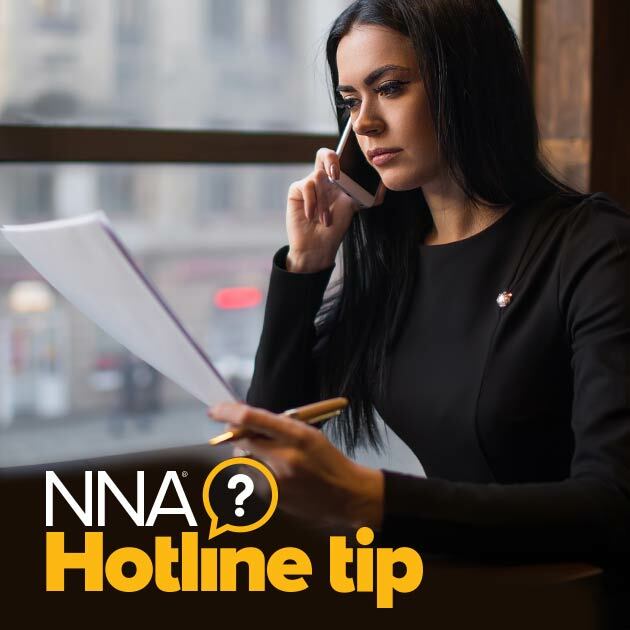 If you are an NNA member, if you prefer you can also contact our Hotline Counselors directly for assistance at Hotline@NationalNotary.org. QUESTION: A purported Massachusetts Mortgage Assignment filed at the Registry of Deeds shows a month and date but the year is missing (blank) for both alleged signatory section and also for the notary's purported notarization section. This seems rather suspect of fraud. Is a purported mortgage assignment valid or void if it lacks the year anywhere within, including missing the year of the purported notarization? This seems at best to an unexecuted document, at worst an outright fraudulent document, perhaps it's both. Regardless, is it valid or void under Massachusetts law??? Hello. We're sorry but we can't answer questions about the legality of a specific real estate document. You would need to speak with a qualified attorney about this issue. A notary public signed and stamped an Affidavit of Service for process server but she did not enter a "sworn to before me date." and document was filed with county clerk office. Is that legal. Hello. We're sorry, but we can't answer questions regarding the legality of documents. You would need to contact an attorney or the county clerk's office to answer your questions. Can I notarize a POA where the person making the POA and named Agent signed in 2013, but now asked that Agent's signature be notarized? If a notary did not include the year she notarized a certificate of marriage, is the marriage valid? Hello. You would need to contact the recording office that issued the marriage certificate and speak to them to find out if the certificate is valid.